If you have a special place on your palate for cacao sourced from Madagascar, you are probably going to love the fruity notes of this beautiful bar. The slight bloom on the bar in the photo above is my fault, it got a little warm in my office this summer. It wiped right off and didn't impact the experience of tasting this bar in the least. 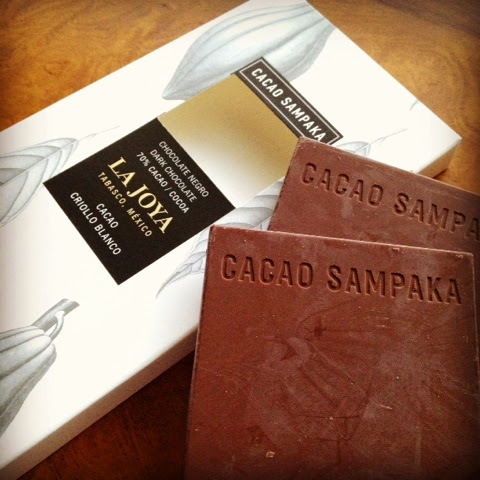 First off, simply beautiful packaging with drawings of cacao pods and leaves in black and white. Classic. Two thin bars come in the package. Flavor notes of plum, apricot, strawberry, that are complex and move swiftly. Thin bar melts quickly so slow down and pay attention. Perhaps a very slight earthy straw note toward the end and then the bar is gone. Break off another piece. Taste again. That is what I did this morning...two or three times. Beautifully complex flavor note . Simple, classic packaging. Exactly the type of experience I am looking for in a fine chocolate tasting. Enjoy your day with chocolate today.